Using an experiment carried into space on a NASA suborbital rocket, astronomers at Caltech and their colleagues have detected a diffuse cosmic glow that appears to represent more light than that produced by known galaxies in the universe. The researchers, including Caltech Professor of Physics Jamie Bock and Caltech Senior Postdoctoral Fellow Michael Zemcov, say that the best explanation is that the cosmic light—described in a paper published November 7 in the journal Science—originates from stars that were stripped away from their parent galaxies and flung out into space as those galaxies collided and merged with other galaxies. The discovery suggests that many such previously undetected stars permeate what had been thought to be dark spaces between galaxies, forming an interconnected sea of stars. "Measuring such large fluctuations surprised us, but we carried out many tests to show the results are reliable," says Zemcov, who led the study. Although they cannot be seen individually, "the total light produced by these stray stars is about equal to the background light we get from counting up individual galaxies," says Bock, also a senior research scientist at JPL. Bock is the principal investigator of the rocket project, called the Cosmic Infrared Background Experiment, or CIBER, which originated at Caltech and flew on four rocket flights from 2009 through 2013. In earlier studies, NASA's Spitzer Space Telescope, which sees the universe at longer wavelengths, had observed a splotchy pattern of infrared light called the cosmic infrared background. The splotches are much bigger than individual galaxies. "We are measuring structures that are grand on a cosmic scale," says Zemcov, "and these sizes are associated with galaxies bunching together on a large-scale pattern." Initially some researchers proposed that this light came from the very first galaxies to form and ignite stars after the Big Bang. Others, however, have argued the light originated from stars stripped from galaxies in more recent times. CIBER was designed to help settle the debate. "CIBER was born as a conversation with Asantha Cooray, a theoretical cosmologist at UC Irvine and at the time a postdoc at Caltech with [former professor] Marc Kamionkowski," Bock explains. "Asantha developed an idea for studying galaxies by measuring their large-scale structure. Galaxies form in dark-matter halos, which are over-dense regions initially seeded in the early universe by inflation. Furthermore, galaxies not only start out in these halos, they tend to cluster together as well. Asantha had the brilliant idea to measure this large-scale structure directly from maps. Experimentally, it is much easier for us to make a map by taking a wide-field picture with a small camera, than going through and measuring faint galaxies one by one with a large telescope." Cooray originally developed this approach for the longer infrared wavelengths observed by the European Space Agency's Herschel Space Observatory. "With its 3.5-meter diameter mirror, Herschel is too small to count up all the galaxies that make the infrared background light, so he instead obtained this information from the spatial structure in the map," Bock says. "Meanwhile, I had been working on near-infrared rocket experiments, and was interested in new ways to use this unique idea to study the extragalactic background," he says. The extragalactic infrared background represents all of the infrared light from all of the sources in the universe, "and there were some hints we didn't know where it was all coming from." In other words, if you calculate the light produced by individual galaxies, you would find they made less than the background light. "One could try and measure the total sky brightness directly," Bock says, "but the problem is that the foreground 'Zodiacal light,' due to dust in the solar system reflecting light from the sun, is so bright that it is hard to subtract with enough accuracy to measure the extragalactic background. So we put these two ideas together, applying Asantha's mapping approach to new wavelengths, and decided that the best way to get at the extragalactic background was to measure spatial fluctuations on angular scales around a degree. That led to CIBER." The CIBER experiment consists of three instruments, including two spectrometers to determine the brightness of Zodiacal light and measure the cosmic infrared background directly. 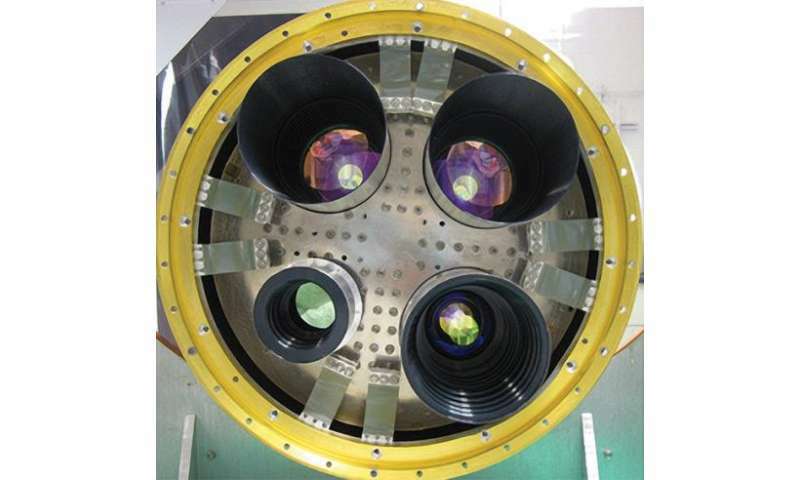 The measurements in the recent publication are made with two wide-field cameras to search for fluctuations in two wavelengths of near infrared light. Earth's upper atmosphere glows brightly at the CIBER wavelengths. But the measurements can be done in space—avoiding that glow—in just the short amount of time that a suborbital rocket flies above the atmosphere, before descending again back toward the planet. Based on data from these two launches, the researchers found fluctuations, but they had to go through a careful process to identify and remove local sources, such as the instrument, as well as emissions from the solar system, stars, scattered starlight in the Milky Way, and known galaxies. What is left behind is a splotchy pattern representing fluctuations in the remaining infrared background light. Comparing data from multiple rocket launches, they saw the identical signal. That signal also is observed by comparing CIBER and Spitzer images of the same region of sky. Finally, the team measured the color of the fluctuations by comparing the CIBER results to Spitzer measurements at longer wavelengths. The result is a spectrum with a very blue color, brightest in the CIBER bands. "CIBER tells us a couple key facts," Zemcov explains. "The fluctuations seem to be too bright to be coming from the first galaxies. You have to burn a large quantity of hydrogen into helium to get that much light, then you have to hide the evidence, because we don't see enough heavy elements made by stellar nucleosynthesis"—the process, occurring within stars, by which heavier elements are created from the fusion of lighter ones—"which means these elements would have to disappear into black holes." "The color is also too blue," he says. "First galaxies should appear redder due to their light being absorbed by hydrogen, and we do not see any evidence for such an absorption feature." In short, Zemcov says, "although we designed our experiment to search for emission from first stars and galaxies, that explanation doesn't fit our data very well. 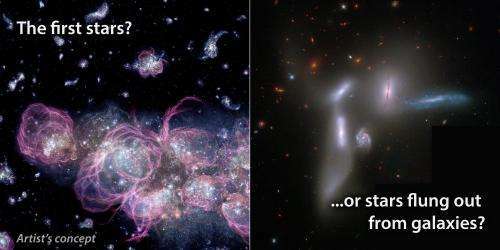 The best interpretation is that we are seeing light from stars outside of galaxies but in the same dark matter halos. The stars have been stripped from their parent galaxies by gravitational interactions—which we know happens from images of interacting galaxies—and flung out to large distances." The model, Bock admits, "isn't perfect. In fact, the color still isn't quite blue enough to match the data. But even so, the brightness of the fluctuations implies this signal is important in a cosmological sense, as we are tracing a large amount of cosmic light production." Future experiments could test whether stray stars are indeed the source of the infrared cosmic glow, the researchers say. If the stars were tossed out from their parent galaxies, they should still be located in the same vicinity. The CIBER team is working on better measurements using more infrared colors to learn how the stripping of stars happened over cosmic history. Low resolution, but fascinating nonetheless. I'd like to advance a wild idea - NOT declare, as cranks do, that it's beyond-any-doubt-true-if-only-scientists-would-listen, just put it on the table for discussion. Could some of the unexplained light be older than the Big Bang? It has some of the characteristics of an hypothetical ancient light: it's got patterns in it, and it can't be nailed down to known sources. Urgelt: Read up on Penrose's conformal cyclic cosmology. It's not at all clear that this line of research is not a dead end however. Penrose et al proposed a sequence of big bangs. One sequence. The mere idea set off a flurry in science fiction circles. For example, could an old object from a prior 'cycle' be discovered by 'people' in a subsequent cycle? Penrose is famous for a certain class of reader. He constrained his hypothesis to something that could reasonably be investigated for evidence. Unfortunately, analysis of the CMBR has thus far produced ambiguous results. The universe *might* be far larger and contain far more complexity than Penrose's proposal. But if that's so, it's a real headscratcher as to how to obtain evidence for it. Could it be that it isn't that there's so much dark matter it's just our failure to see? did you read the whole study? the supplemental material is a 55 page pdf!! is your explanation based upon your falsified faith: aw/daw? It *is* interesting that in certain mathematical reductions of the CMBR data available to us, crop circles pop up. Somebody has a cosmic lawnmower and a sense of humor! Though you can probably make circles appear mathematically (mathemagically?) out of any sufficiently large noise sample, if you work at it. The authors obviously worked at it. There is the other sock puppet! imido, you are deluded. You are stringing together words excerpted from science to make beyond-any-doubt certain declarations which science itself hasn't made. That's just so perfect a phrase for separating delusion from actual science. It sure sounds sciency! But no peer-reviewed scientist has *ever* declared certainty about what dark matter is, let alone that it forms nodes of whatever shape, or foam - that last word was excerpted from hair-on-fire speculation about what might be at the Planck scale, completely unfalsifiable. Scientists do speculate. They do throw out ideas that are unproven. That stuff does get peer-reviewed. But scientists know how to tolerate uncertainty, how to express an idea as a *possibility. * You do not, and that is the tragedy of impaired cognition under which you sadly labor.